Welcome to the website for Wolf, W: High-Performance Embedded Computing: Architectures, Applications, and Methodologies. 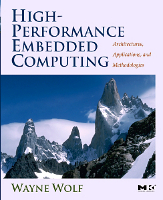 Below are links to various embedded computing resources available on the World Wide Web. Electronic versions of figures for use in your course are available. Access to this material is available at our instructor site.